I moved to Hebden Bridge over twenty years ago. In the course of these years, I have travelled, made friends, lost friends, seen my son leave for the south and even spent some time living in Manchester. But in all these years the one thing I haven’t really done is explore the country that has become my home. In the past few years, I have walked some of the hills but that is about it. In the muddle of bringing up a family and earning a living, I have almost wholly missed out on what might loosely be called seeing the sights. Earlier this year I was pricked into doing something about this by a friend who was engaged in making a video about Accrington. Accrington. Accrington !!! Yes, she said. “You should go. It has the finest collection of Tiffany glass in Europe.” So I did and this spurred me into the idea that this summer, I would be a tourist from my own home going out at least once a week to see a ‘sight’. Probably most of you reading this have done all this long ago. Perhaps not. Anyway, the photographs, taken from the respective websites with thanks, are pretty. In 1891, Joseph Briggs left Accrington, aged 17, for America. He initially worked for a Wild West Show but then took work with the Tiffany Glass Company, becoming its chief designer and, eventually, head of the firm. 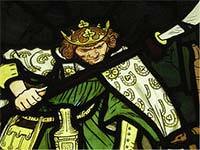 In 1933, he sent his personal collection of small glass pieces back to his home town which, initially, seems to have stored them in a cupboard before, in 1970, exhibiting them in its Haworth Gallery, an Edwardian mock-Tudor arts-and-craft house bequeathed to the town by a local cotton manufacturer. There are nine areas of parkland around the house and a varied art collection but the star of the show is the glass, beautifully displayed. You really should see this. It is an international standard exhibit within 40 minutes drive from Hebden Bridge. 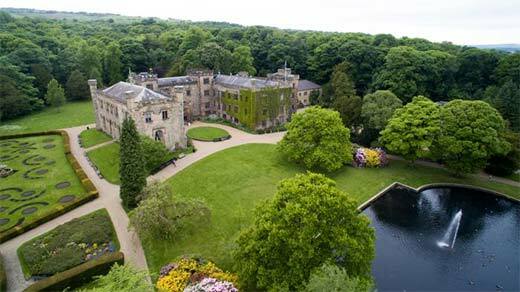 East Riddlesden Hall is a National Trust property set in the not very inspiring setting of Riddlesden on the outskirts of Keighley. Historically, the Hall was the home of wealthy farmers and merchants and fell into great disrepair to the point where it was threatened with destruction. It was saved by twin-brothers, the Briggs, one of whom was Mayor of Keighley who bought the house in 1933 for some thousands of pounds and donated it to the National Trust. It has magnificent gardens and contains a stunning old barn. Essentially a mid-17th century gabled house, it has seen many changes including demolitions over the years so that it a rather odd mix. It has a great collection of artefacts including furniture, ceramics and, particularly, some very good 17th and 18th century needlework. 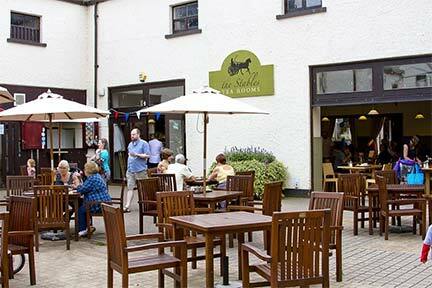 Like most National Trust property it has a good café and shop. Entrance is quite steep at £6.55 though children are only £3 and you get £1 off if arriving on a Keighley bus. Towneley Hall dates from the 13th century and was the home of the Towneley family for over 500 years but in 1901 it was sold to Burnley Corporation. The family departed in March 1902 leaving behind a building almost completely empty except for a couple of tables and a few pictures in the chapel. Architecturally, though imposing, it is a bit of a mess with an Elizabethan long gallery, a Victorian kitchen and various priest-holes and secret passages. It houses a huge display of ‘stuff’ ranging from Egyptology to a lot of 18-19th century painting. Its glory is the 445 acres of parkland which surround it, recently restored by a £2 million lottery grant and which offer all kinds of activities. Entry is now £5 for an annual pass. Lotherton Hall is an Edwardian country house built on the site of earlier Georgian and, possibly, medieval buildings. The only remnant of the latter is an outside chapel which dates back to the twelfth century. There is a large series of formal gardens laid out in the early twentieth century which are being restored. 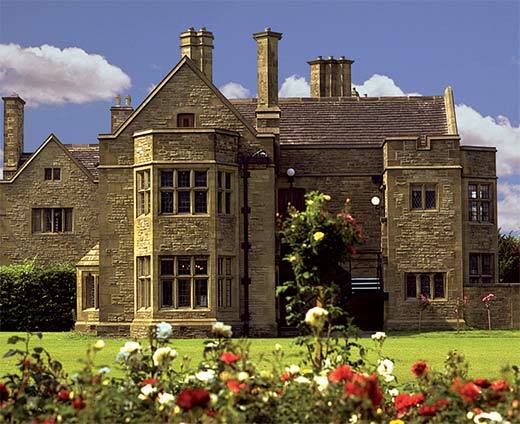 Lotherton Hall houses a wide variety of artefacts, notably ceramics and a series of Fashion Galleries. It has a good café. Entry is £6 including car parking which is extensive but sometimes boggy. It is about an hour’s drive. 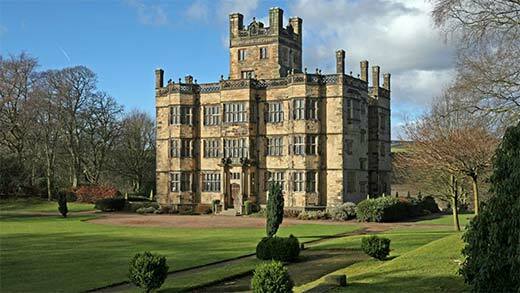 Gawthorpe Hall, a National Trust property is, architecturally, the most interesting of the properties described here. 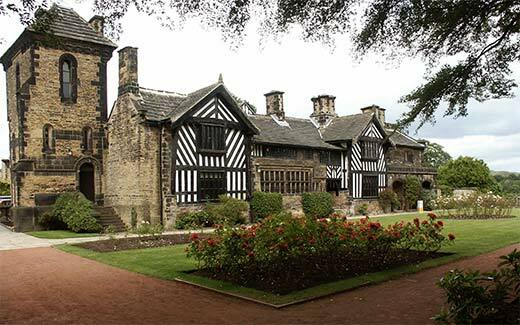 Built in the early 17th century by a Reverend Shuttleworth, it remained in the family until the 20th century when it was given to the National Trust who leased it to Lancashire County Council who still administer it. Although remodelled in the mid-19th century, it remains essentially as a Jacobean manor house with, perhaps most unusually, a good deal of its original interior including some stunning plasterwork ceilings. An internationally important and fascinating part of the house, operated as a separate charity, is the Gawthorpe Textiles Collection, based upon a huge range of material collected by the last owner of the house, Rachel Kay-Shuttleworth who began collecting in 1912, continuing until her death in 1967. 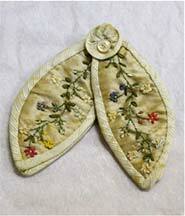 The collection contains 30,000+ pieces spanning five centuries, some of which are displayed in upstairs galleries. The charity continues her work, running various craft workshops throughout the year. Entry to the Hall is £4 and there is a good tea-room and parking. It's a 40 minute drive from Hebden Bridge. 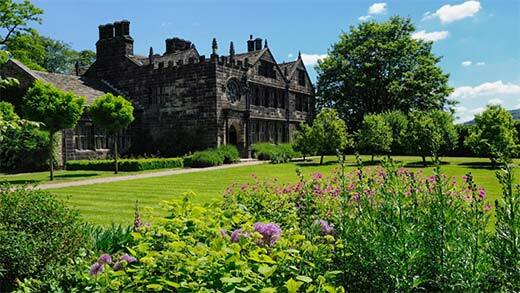 Shibden Hall is said to date back to about 1420 and something of its Tudor frontage may date back to then. 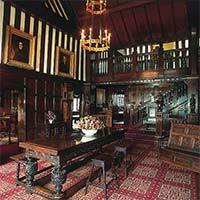 However, it has been extensively remodelled and extended over the centuries, in particular by its most famous owner Anne Lister who added the apparently authentic Gothic tower and also the dark wood hall. The very helpful volunteer guides will help to disclose the old pillars and wall-paintings which are largely hidden by the more recent changes. The oldest part of the Hall are the adjacent 17th century aisled barn and workshops, which house a carriage collection and displays relating to different crafts, including a blacksmiths, coopers, wheelwrights and saddlers as well as recreated brewhouse and inn. Destined to become nationally famous by the forthcoming BBC series on the life of Anne Lister, Gentleman Jack, it may be best to visit Shibden soon. One word of warning; eat sparingly at the café in the Park below. It’s not really a castle of course, rather a grand mansion built for a local textile manufacturer in the 19th century. It was acquired for Keighley Council in the 1950s, extensively remodelled with parts of it being taken down, and now turned into a local museum. Cliffe Castle has a grand Victorian dining room, lots of the kind of artefacts that Victorian manufacturers might have collected and extensive gardens. The thing that makes Cliffe Castle almost unique, however, is its set of stained glass windows designed for William Morris by the gang of pre-Raphaelites including Ford Madox Brown, Burne-Jones, Rossetti and William Morris himself. Beautifully presented in a separate gallery, these windows are worth the trip itself, perhaps before the V&A steals them. 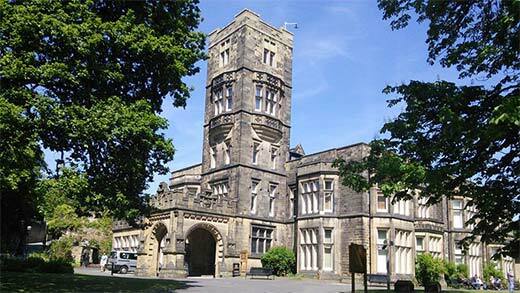 Cliffe Castle has free entry and is open Tuesday to Sunday. It is a 30 minute drive. Of course, I have’t seen everything and perhaps it might be best to visit some place whilst they still exist. The Red House in Gomersal has already gone and the fate of the Tolson Museum in Huddersfield remains in the balance. Last year, five museums in Lancashire were closed and, with continuing cuts, in council budgets, museums are often placed in the firing line. It is also the fact that places once free now have quite steep entrance charges. They mostly have good cafés and it is usually worth the drive just for the cake. See also: discussion of this feature in our HebWeb Forum.